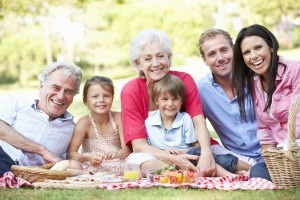 Heading out on vacation is a time to relax, have fun, and enjoy quality time with your family. While you are exploring and experiencing new things together, however, it is important that you don’t overlook your senior’s regular care needs. Just because they are on vacation does not mean that their needs change or lessen. In fact, needs often increase when out of a normal environment, such as when you are on vacation. One of these needs is your senior’s diet. What your elderly parent eats makes a tremendous difference on their health and well-being, especially if they are living with a particular health problem or difficulty that requires a closely managed diet, such as diabetes or congestive heart failure. Fortunately, there are ways you can help your parent to maintain a healthy diet while they are on vacation. With some preparation and planning, you can ensure their health is protected even while they enjoy this special time with the rest of the family. Choose a vacation rental house or an efficiency hotel. When planning accommodations, consider either a house or an efficiency hotel. These offer kitchens, with the house offering more complete amenities and appliances. This allows you to purchase the groceries your parent needs and prepare healthy, satisfying meals and snacks so you don’t have to wonder how they will stick to their dietary guidelines. Bring along snacks. Whenever you are on an outing or activity during the vacation, bring along snacks. This will ensure your parent has access to foods with balanced nutrients rather than reaching for unhealthy convenience options. Healthy snacks ward off hunger pangs, boosts energy, and supports better mood. Stay consistent with the schedule. Vacation often means staying up later, being on the go more, and grabbing food when you get the chance. This can be fun, but it can also set you up for hunger, tiredness, crabby moods, and eating unhealthy food. Instead, do what you can to stay consistent with your schedule. Eat meals at the same general times you do when you’re at home, and take your time eating. Rather than eating mindlessly while in the car or while walking around, take a break and enjoy each meal or snack. Eating a healthy diet is an important part of preserving health and well-being, managing health conditions, and supporting quality of life. Helping your aging parent to maintain a healthy diet on a regular basis can be one of the most valuable a services offered by a senior care provider. All of the services available to your aging loved one are completely personalizable, meaning they will have access to the care and support that is right for them. When it comes to eating a healthy diet, this senior care provider can help your parent grocery shop to stock their home with the right foods. They can also research recipes with your parent to find those that fit in with their dietary requirements while also remaining delicious and satisfying. Finally, a senior care provider can also help your parents with meal and snack preparation, even getting your parent into the kitchen with them so they can prepare foods together, which benefits your parent on a variety of levels. For Senior Care Services in Oakland TN, please contact the caring staff at Personal Care Services MidSouth today! This entry was posted in Healthy Eating for Seniors, Senior Care Oakland TN and tagged Senior Care Oakland TN. Bookmark the permalink.